In line with the nation’s 60th anniversary of its Year of Independence this August, MPH Publishing is celebrating Malaysian writers during the national day season. I didn’t look too closely at the faces in the poster but I instantly recognised the familiar face of former Prime Minister, Dr Mahathir Mohammed. I thanked my friend for his kind wishes and told him, while I’m somewhere at the bottom of the list with Dr M and others at the top, I’m still glad to be counted among Malaysian writers in the MPH Writers’ Circle. It was much later, when I found the time to look closer at the poster and spotted my own face (and due to sheer vanity) wished MPH had picked a better shot of me than this old photo. Even I almost couldn’t recognise myself because I had grown my hair out then and I hardly look that way now. 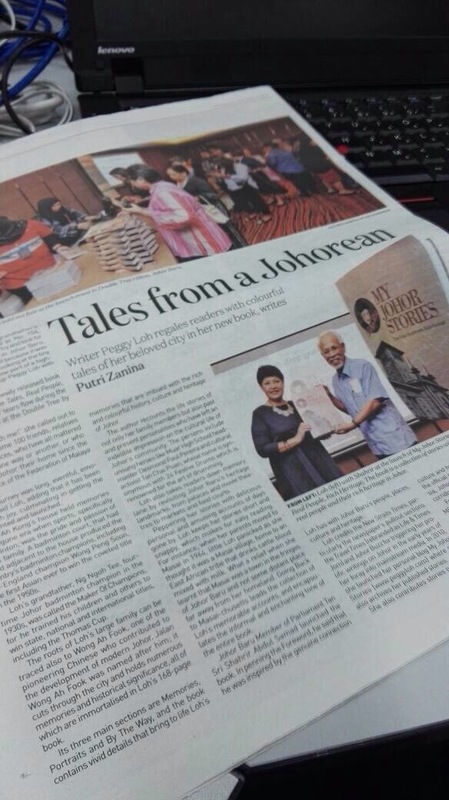 On Aug 17, “Tales from a Johorean” written by Putri Zanina Megat Zainuddin, my former editor in Travel Times, the pull-out section with The New Straits Times, was published in NST Life & Times Jom. It was a report on my book launch event which she graciously attended in Johor Baru. Putri is meanwhile, back in Kuala Lumpur, reading my book to write her book review. 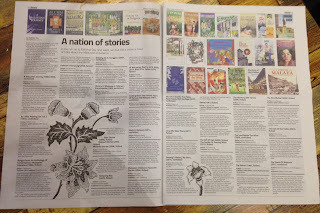 On Aug 20, the Sunday Star published a two-page feature entitled, “A nation of stories,” and I was both delighted and humbled to see that My Johor Stories: True Tales, Real People, Rich Heritage, was listed among the book titles here! There was just a brief write-up about my book but I’m ever grateful that it was counted among the list of distinguished Malaysian book titles mentioned in this feature. In the past few weeks, I had the privilege of more new experiences including giving an introduction of my book at the club meeting of the Rotary Club of Johor Baru, and being interviewed and filmed for a segment in the Think City Johor Baru corporate video. A date was set for a Meet-the-Author session at MPH bookstore at Johor Baru City Square and as it was a public event, I did not know what to expect. When info about this event was shared online, one of the first people to respond was Ahmad Fadhli who not only told me that he was coming to get his books autographed, he also sent me a photo! Throughout this time, MPH Publishing was in touch to keep me updated about my book and I’m deeply humbled that my book remained on the MPH Non-fiction Bestsellers list for four consecutive weeks. I’m glad that readers can identify with the contents of my book and are happy to have a copy of their own as well as present it as a gift to others. 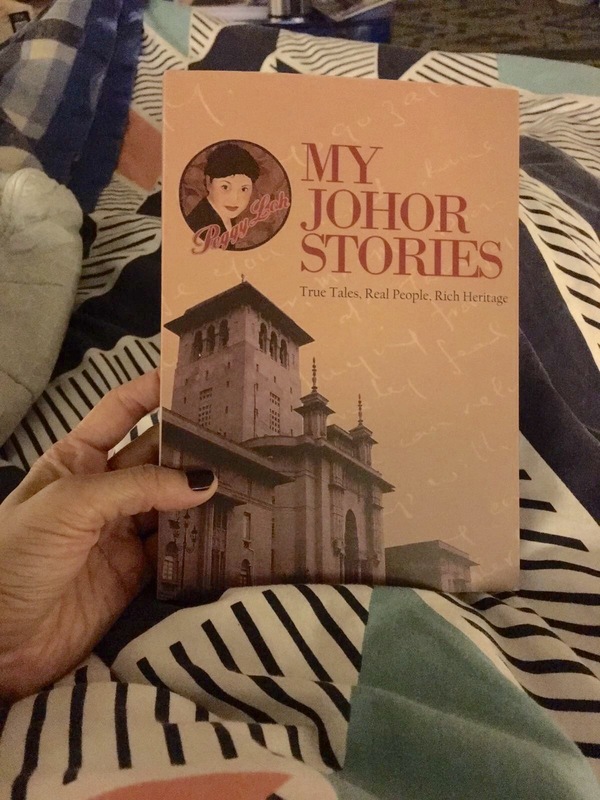 It’s such a thrill to know that copies of my book, My Johor Stories: True Tales, Real People, Rich Heritage, has left Johor and Malaysia, being sent abroad to be read and enjoyed in other continents. My nephew, Aaron, who was at my book launch event, hand-carried copies back to Perth, Australia, and also put a couple of copies in the mail to send to family members in Sydney. The family there, gathered in cousin Malcom’s home for a comforting steamboat meal at the height of their winter, had fun reading snippets from my book and sharing memories from our family photos. Among the guests at this meal were our niece, Olivia and her friend, Peter. Aunty Polly and Uncle Steven were also there on holiday from USJ, so receiving my book in this gathering was probably one of the highlights of the evening. After the meal, (I was told) uncle was hogging a copy of my book while Olivia was holding another copy and reading parts of it to Peter, in an attempt to give him a quick intro to our family! Aunty Polly regretted not being able to attend my book launch event because she was with her family in Sydney, but I assured her that she will have her own copy. And when she reached home, it should be waiting there for her. She was searching for it when she got home but in vain. I had passed the book to my brother, (who lives nearby) to send it over but it looked like my book was not delivered yet! My brother responded to my “rush-it-over” message and to prove that he had presented my book to our anxiously-anticipating aunty, he shared a photo with me. Meanwhile, my friend Linda had put a copy in the post to for her daughter, Noreen, who lives in Melbourne and I was pleasantly surprised to hear from her with a congratulatory message. She even shared a photo of my book to prove that she was already holding it! “My read as we’re out glamping for the weekend and whilst the lil’ man was passed out for the day,” read her message – referring to how she found time to read my book once her active son had fallen asleep! “Awesome book, Aunty Peg! Feels like I’m getting to know more about your family,” she added. Soon after my book was launched, I was in the UK on a family trip and brought copies of my book to present them to my sister and her family and also to cousin Bernice, who wanted it for herself and her friends. My sister even had the strategy to keep one book available to circulate on loan to those who wished to borrow and read, while she kept one hardcover copy for herself! Then we received the bad news from Sydney. Cousin Malcolm’s wife, Yeen, who has a hobby in hiking, often went on trips with her hiking friends, sometimes even camping out for days in the Australian bush. Recently she went on a hiking trip to Snowy Mountain, about five and a half hours south of Sydney. We were told later that early one morning, Yeen went for a walk and slipped on some ice. Her fall caused her excruciating pain because she suffered at least two fractures on her bones. Thankfully she received medical attention quite swiftly and the surgery on her leg was a success. As she was recuperating in the hospital, Malcolm showed me how Yeen was making good use of her time – reading my book! Then on Aug 21, I was shocked and saddened to receive news that my friend, Aidah was admitted to hospital. She was able to send text messages, so I was reassured that she was not dangerously ill but it was just as bad to be a victim of dengue fever. Her husband and son were there when I visited her in hospital and to cheer her up, I presented her with a copy of my book. I’m pleased that Aidah is also on the road to recovery and should be going back to work again soon. Later, Aidah told me that her cousin, Yani, who lives in Felda Bukit Besar and reads My Johor Stories online, is my secret admirer. [Blush! Blush!] Thank you, Yani, but it’s no longer a secret now! “It’s pouring buckets out here. We’ll probably get into City Square at 2.30pm,” was the message Gwen sent as she inched her way through the city traffic. She was bringing her mum to my Meet-the-Author event arranged by MPH at their bookstore in Johor Baru City Square. I glanced at my watch and figured that the stormy weather was another reason to deter readers from making their way into one of the most congested areas of our city during the weekend. This Meet-the-Author event was yet another new experience for me. Because it was held in the mall and opened to public, I was prepared for the unexpected. But I did not anticipate such bad weather. My family’s love and support throughout my book project journey, were essential ingredients that kept me going on, in spite of the many personal challenges. I laughed at her use of this colloquialism because it aptly described the positive support of a friendly busy-body! But now, she was going to be late. Then my phone signaled a message from a friend who said he was coming to the event but he was unwell and on medication, and gave his apologies as he couldn’t come after all. I sent him Get Well wishes along with a snapshot of the MPH Bookstore façade. I was in the bookstore and took a few moments to walk about to get a sense of the place. I saw how MPH had set up the event area directly in front of the Bestsellers display wall, with a table and sound-system, ready for the author [me!] to meet the readers. A few chairs were arranged in front of the table for an audience, if they wished to sit, because I would give a brief introduction to my book, My Johor Stories: True Tales, Real People, Rich Heritage. MPH staff displayed my book prominently as a backdrop to the table but soon after the event was over [I saw how] they rearranged the best-selling books with the Bestsellers Lists displayed on that same wall. It was deeply humbling to see My Johor Stories: True Tales, Real People, Rich Heritage among the best-selling Non-fiction titles for four consecutive weeks and once again, I must thank all the readers for their interest and support for this Johor storyteller! This was one of the first statements I expressed to the audience in the brief intro to my book. Among them were friends, family members and readers whom I just met. Ahmad Fadhli was an early-bird who made sure he could get his books autographed so that he could present them to his friends. He came well prepared with a written list of names to help me get the spellings right – and I was happy to address them – one-by-one book. Among the names was YAM Tunku Mariam Iskandar, a sister of the Johor Sultan. I recently met Ahmad Fadhli, a young author who was researching the Johor royal family to write a book in Malay, on the late Sultan Ismail. Another reader, Muhammad Nassim, wrote to my blog to confirm if this Meet-the-Author event was on because he wanted to come over. And he did. He also brought along my book which he was already reading, for me to autograph. After I signed the books for Carol-Ann, a Canadian who was living in JB for the past four years with her husband, an expatriate working here, she told me that she was looking forward to hearing me speak at their club. It took a moment for me to realize what she was referring to because there are plans for next month to meet the ladies of the Johor Baru International Women’s Association to talk about my book. I assured Carol-Ann, a member of the JB IWA, that the contents of my book would certainly be enriching knowledge to new residents of Johor. A couple who were browsing in the store, told me they were not from Johor but since they have moved to live here for work, my book should help them get to know more about Johor, her people and her heritage. The rain must have abated by then because there was a sudden surge of shoppers in the store and several came to me to have their books autographed. One of them was a lady who I distinctly remember, told me that her name was Tiang, as in lamp-post! So I wrote in her name as Tiang and continued to address the other books to her former classmates - Sai Hiang and Sue – who now lived abroad. She told me they were SIGS alumni and are thrilled to read about their former school principal, Mrs Dawn Parry. The late Mrs Parry is among the Johor personalities featured in the Portraits part of my book. Some familiar faces who turned up were Andy Loo and his family from Taman Daya. They were not able to join me at the book launch so they made it a point to drop by to get signed copies of my book. Jason, Andy and Judy’s young son was going to be named the “youngest” reader of my book until Angela Ho turned up with her two and a half-month old son, Ezra! If you think Angela sounds familiar, she along with her sister, Jennifer, and their family, run Niniq Javanese Cuisine in Taman Molek. So young Ezra now holds the record as my “youngest” reader! I was pleasantly surprised to see Joseph Chia (read: dog rescue/shelter) walking into the bookstore with an older gentleman. I had a sudden flashback to my visit to St Joseph’s School with their old boys for a school reunion event several years ago. I fished around my memory bank for his name and it suddenly popped up: Mr Toh. Joseph is a St Joseph School alumni who brought his former teacher to my event. My brother, who’s also St Joseph School alumni, was certainly familiar with Mr Toh, so they had a good catch-up chat. We had a good laugh later when my brother told us that only the “naughty” students would instantly recognise Mr Toh because he was (to put it mildly…) a strict disciplinarian who applied unforgettable methods of punishment! It was some time since I last met Vimi and when she came in with a tall boy, I guessed it must be her son, Ajay, who has since grown up from his former scrawny frame. How time has flown! Now he was no longer bashful and he even boldly posed for photos! Vimi [Right] with her son, Ajay! And of course, Gwen arrived with her mum on time for the start of the event and I had the pleasure of signing in her book. All too soon the time for the event was up. After I autographed the last book, I thanked the MPH team for their help in setting up the place for my event. They are a good-natured group and they too had fun posing for photos with my book. After such an exciting afternoon, my family and I adjourned for coffee at the café next door. And just as I was relaxing with a sip of hot hazelnut latte, I looked at my phone (which was still on silent mode) and jumped. She replied as quickly: “OK, will be there.” And she came to the café, armed with my book. Not only did I autograph the book for her, I also took her back into MPH Bookstore to capture that moment with a photo memento. After a brief chat to bring me up-to-date about the school choir’s recent success in an international choir competition, Emilda, a teacher with the JB Convent, left us. Thank you, MPH for arranging this event. Thanks also to all who came by. It really means a lot to me to see these readers, who took the time and trouble to brave the stormy weather and fight the city traffic – and also to hunt for an elusive parking space in JB City Square – just to meet me for my autograph! I also thanked Emilda for her effort to come. I regretted her initial disappointment but was glad I could still meet her and made her trip worthwhile. Indeed, I’m so very blessed. I was having lunch with my aunt and sister when my phone signaled a message. It was Faezah Ayub from Think City Johor Baru, asking if it was convenient to have a quick chat. My sister and I were with our Aunty Sylvia for the past few days to help her sort out her things as her family was vacating their property in JB. It was indeed, an overwhelming task to pack away 30 over years of treasures and memories but that’s another story. So there we were enjoying the meal of my aunt’s choice and talking about the next phase of our packing project when I read this phone message. It made me wonder what Think City wanted from me, so as soon as I could, I replied asking her to call me. She called without delay – which further increased my curiosity over what was the urgency – and when she explained the purpose of her call, I let out a whoop of laughter! Think City JB was making a corporate video and it will feature some of the grantees. She asked if I could avail myself in the next two days when the crew was in JB to shoot this video – which would include an interview with me! Quick thoughts flashed across my mind because this is yet another new experience for me. In the course of my work, I’m the one asking the questions and interviewing people but now the tables are turned and I was to be interviewed. Usually I'm the one behind the camera but now, I would be in front of it. I recalled setting up an interview for a crew from Kuala Lumpur to meet Uncle Roland for his input to make a documentary on the Thomas Cup team of 1949, and how I had to prepare uncle with a list of possible questions to keep him focused and for the video shoot to go more smoothly. Bearing this in mind, I asked Faezah if the producer can provide some questions so that I may prepare myself before the interview. I’m aware that the segment that will feature my book project with Think City would probably be hardly a few minutes but producers may record as much as three hours of interview in order to select the bits that they want! Nevertheless, it was still helpful if I was given some idea of what I should speak about before the interview. I don’t have a problem talking about a topic which I’m passionate about but it was different because it was an interview that was being recorded. The next morning, I received a list of possible questions and while I gave it some thought and jotted down a few points, I found out [later] that the producer had something more in mind for me to talk about in the interview! The weather was scorching as I walked over from the parking lot in front of the City Council office. I could see the crew was already setting up their equipment in Think City’s office when I arrived at the appointed time on Friday afternoon. The first thing that struck me was how stuffy it was inside the office, not because of the crew and their equipment, but because the air-conditioning downstairs was out of order! Taking the uncomfortable situation in my stride, we just carried on regardless of the poor ventilation because – as they say – the show must go on! That's her note book filled with questions to quiz me! The Director & Content Producer, Corinne, did her best to make me feel comfortable as we spent the first few minutes doing a crash-briefing [if there’s such a word!] about what she would be encouraging me to talk about. When the crew was ready, I was fitted with a microphone pack and asked to sit on a tall stool at the required angle in front of the camera. Corinne was seated opposite me, tucked in the shadow of the camera. She had briefed me about the other subjects on which I should share my opinion so I was ready for the onslaught. So with the spotlight trained on me, the camera rolled and I started talking to Corinne and along the way, she prompted me to get me to elaborate on certain points. We only paused once to have a sip of water to drink and carried on until Corinne had covered all her questions [she had a note book as well as notes in her handphone!] and was satisfied with my replies. After we wrapped up the interview, we took a break while the camera captured some close-up shots of a stack of my books. Then we were off for a walk through JB’s heritage area [where Think City’s office is located] with me holding a copy of My Johor Stories: True Tales, Real People, Rich Heritage. The crew took a while to organise two cameras and when they sent up a drone camera, it almost got crashed by a flock of pigeons that flew up in shock at this alien object in the air! It was good to be outside again and as I walked the pavement along Jalan Pahang and turned into Jalan Dhoby, I could hear Corinne’s voice reminding me to slow down because I was striding way too fast for the cameraman who was walking backwards ahead of me. I was familiar with these old streets but when I thought about the un-user friendly and uneven pavements, I immediately slowed down. We paused at the Jalan Dhoby - Jalan Trus crossroads where the camera was set up to film me with the façade of JB’s iconic Hwa Mui coffee shop as a backdrop. Corinne patiently directed me to “act” the part she had in mind but I failed at capturing the essence of what she desired. Publishing this book was a deeply personal journey and it was difficult trying not to express it to the camera simply because it is just so personal. While she wanted me to feel the pride and smile in a certain way, I was feeling the entire opposite because the thoughts evoked made me sad and I had to swallow rising tears. Finally Corinne and the cameraman reviewed the several takes and she called it a day, satisfied with what the camera had done. Whew! I was just relieved that it was a wrap! 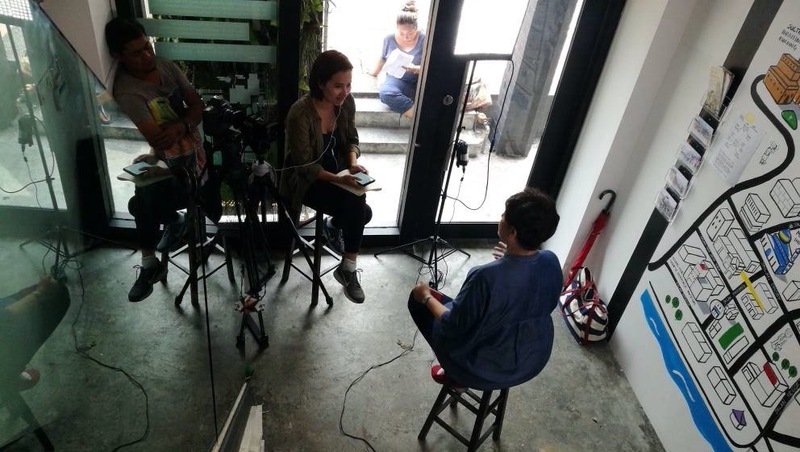 The crew then went on to film another Think City grantee at Jalan Tan Hiok Nee. Thanks, Think City, for letting me have yet another new experience with this video shoot. I can’t wait until all the editing is done and we view the final video that may comprise just a few minutes of the many hours the camera was filming each grantee. Before the Southern section of The New Straits Times newspapers called Johor Streets ceased its publication in 2015, I often covered community events and had the privilege to work with the Rotary Club of Johor Baru (RCJB) and shared their community projects in this section. 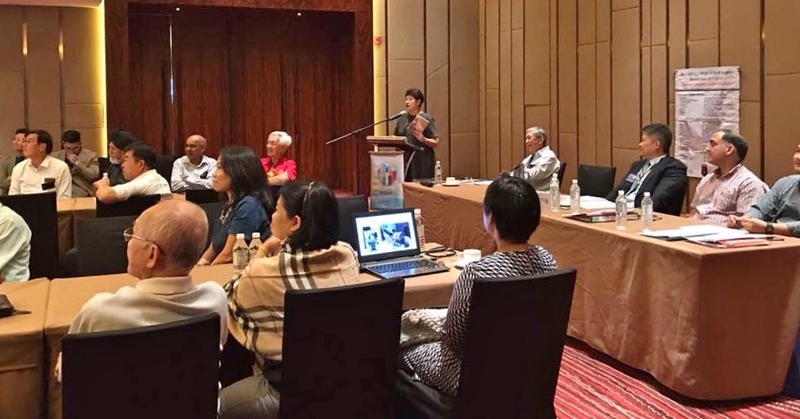 Over the years, as I got acquainted with the projects initiated by RCJB, the oldest Rotary Club in Johor, I had the opportunity to join the club in fund-raising activities and president installations and report on them. The members of the club soon became familiar with what I was doing to share with readers, their community projects and how people were benefiting from it. Among their signature projects are the Rotary Hemodialysis Centre and the Palliative Care Association of Johor Baru which continues to help needy patients in and around JB. Besides education programmes to fight the spread of dengue, they also run a home for children from underprivileged families and have a commitment to wipe out polio in this part of the world. During their annual Rotary District Assembly of Rotary International District 3310, I was often invited to join their Spouses Programme that usually included a charity event as well as visits to places of interest here. So I was not only acquainted with the club members but also with their wives. I also had the privilege of getting to know several club presidents and their community projects. This year, after Datuk Teo Shiok Fu was installed as the 66th President of the RCJB on July 1, he graciously agreed to attend my book launch event on July 15. Datuk Teo probably didn’t know it then but at my event, he learnt that I featured the RCJB among other Non-Governmental Organizations in my tribute to unsung heroes. Back in May, I was a guest of the RCJB when they held their regular meeting at the Amari hotel. I accepted their invitation and joined them at this meeting because I too wanted a peek into the hotel that was built on the site of the former Rex and Lido movie theatres. It was good to meet the club members again at this meeting and I remember sitting next to Dave Chellam, who happened to be a former classmate of my Uncle Victor, at Saint Joseph’s School. It was there that I agreed to be a guest speaker at a future club meeting because I had a topic to present and it would be good to share it among old friends. A date was fixed four weeks after my book launch and as the date drew closer, I was given a gentle reminder of the date, time and place for their regular club meeting. Incidentally, their meetings are held at the DoubleTree by Hilton JB, the same venue where my book was launched. So it was like a home-coming as I prepared to speak to a room full of gentlemen club members with a handful of lady guests. As Rotary Club meetings go, there was a structure and format – quite formal but still relaxed. By sounding a gong, the club president called the meeting to order. I was pleasantly surprised to discover that the guest speaker was to sit next to the club president at the front of the meeting hall. So I took my place next to Datuk Teo and paid attention as the meeting kicked off with the usual proceedings. Then Past President, J S Kwang was invited to give a brief introduction of the guest speaker [me!] and in a typical Kwang manner, complete with his lawyer-like flourish, he gave me a glowing intro. The screen was set up at the opposite end of the hall and I was told that I could speak from my seat at the other end the meeting hall. But I preferred to stand and moved to the podium to present a brief introduction to my book, My Johor Stories: True Tales, Real People, Rich Heritage. All eyes were riveted to the screen as photos were shared to illustrate my presentation. I had 20 minutes to speak and it would be followed by a Question & Answer session. While there was a handful of expatriate club members, the majority were Malaysian and a number were also Anak Johor, like me. So they were able to relate to what I shared in selected stories under the Memories and By the Way sections of my book. They were however, more than familiar with some of the personalities featured in Portraits whom I highlighted in my talk. They included the late James Ho, who was not only a founding member of the RCJB but also an active member and regular attendee at weekly meetings until he no longer could attend due to poor health. Another personality they were familiar with was the late Dawn Parry, gracious spouse of a Past District Governor, the late Michael Parry, both educators whose illustrious careers made a powerful and positive impact upon their students and peers. At the close of my talk, I was invited back to my seat while the members took turns to ask questions or share their thoughts about particular points I mentioned that triggered off some fond memories of JB in a bygone era. With so many members standing up to ask/speak, it was an informative and interesting Q & A session that threatened to run over time but in the tradition of Rotary Club meetings, there was a close watch on timekeeping. This session was neatly wrapped up and finally Past President, Dr Shanmugam, better known as Dr Shan, was invited to give a formal word of thanks to the guest speaker, on behalf of the club. Renowned as the club’s historian, Dr Shan also has a penchant for penning poems and verses. In fair Johor Baru and its surrounds in tow. As was customary, club members were invited to show their appreciation to the guest speaker with a round of applause. And when they clapped their hands, they also stood up! I must confess that it was a most humbling and unforgettable experience to have a room-full of distinguished gentlemen standing up to clap in such warm appreciation! After the meeting, members came to talk to me and gave their kind compliments and comments about my presentation and the book. Some were even disappointed that I did not bring along books for sale but I assured them that they were available at the MPH bookstore in Johor Baru City Square. Speaking of JB City Square, I suddenly realised that in all the excitement, I missed out on making the announcement about the autograph session planned by MPH at JB City Square on Saturday, Aug 26. I will be meeting readers from 2pm at the bookstore, to give a brief introduction of my book and to autograph their books. I remember that Club President Datuk Teo said that he learnt a great deal more about my book project because he reads my blog, so I trust he will help to share this information with the RCJB members without delay! Thanks very much, Datuk Teo! 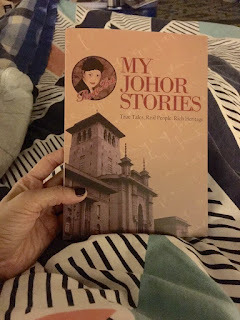 Got your copy of My Johor Stories?